I love audio, but am fairly scared of music making. I am a bit of a klutz musically, can’t clap in time or keep a tune. I’ve already created a couple of bumpers for ds106: Jim Says, Listen to the LoDown and DS106 Confusion. both relied on music from someone else, one a GarageBand loop the other a steal. This time I though I might step up and make a noise. Given the lack of musical talent I decided to try a Magic Garageband production. This allows you to make some ‘music’ by choosing a genre and playing with the variables (instrument styles). 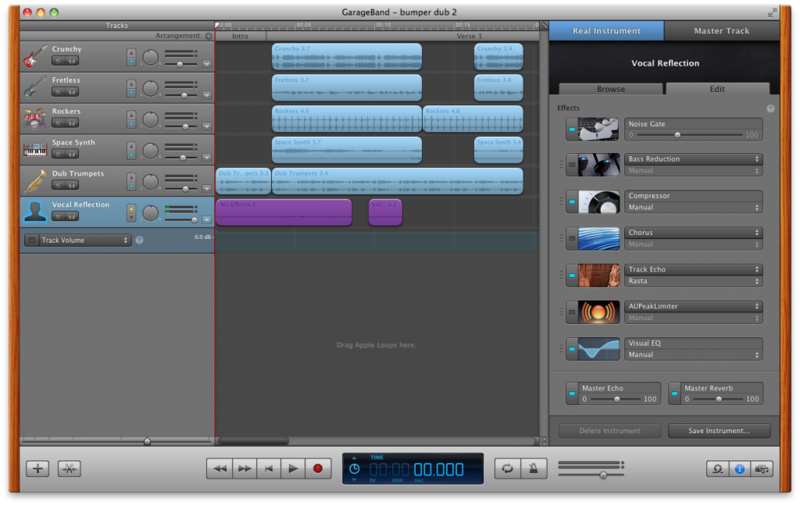 I did this for a while and then passed it on to the ‘real’ garageband interface. There I chopped it down to a very short segment and added my voice. Some effects added to the vocals. Then I dropped out a few bit to give it a dubish feel. I quite like the announcement feeling from the brass. I made a quick edit of the ds106 skul and crossbones to make a skull and trumpets. The number two in the tile comes from the fact I ‘saved as…’ at one point where I did’t want to lose something that sounded better than nothing. The text plays on the idea of ds106 being open, I am more of a ‘romantic socialist’ than a business man. I am also thinking of ds106 being play rather than work. Ok — so I have never tried the Magic Setting in GB and now I need to get in there and see what it is. Thanks for sharing and pointing me in another music-making direction.